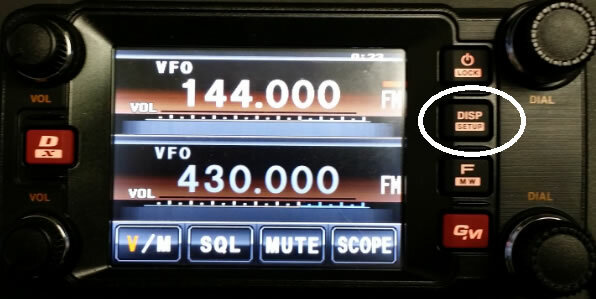 Programming the Yaesu FTM-400 radio is done with the RT Systems ADMS-M400 Programmer. You can program any FTM-400 radio using a micro SD Card. For radios with firmware version 2.0 or higher, you can use the SCU-20 cable that comes with the radio. The RT Systems software will work with the Yaesu SCU-20 cable. 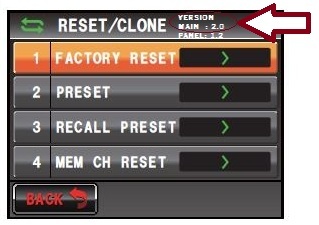 Step 2: From the menu, select RESET/CLONE. Don't worry, you won't reset your radio. You will find the radio version number at the top of the screen that appears. "Main: 2.0" is what you are looking for. Click "Back" twice to exit. 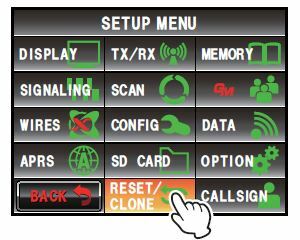 If your radio is less than version 2.0, Yaesu has released a firmware upgrade to address the earlier radios. If you were using the RT Systems ADMS-M400 programmer prior to doing the firmware upgrade on the radio, be sure to complete Communications| Get data from radio into a New file (File | New) once the upgrade is completed to tell the programmer that the radio has been upgraded. Once this process finishes, you can send your original file to the radio (Communications | Send data to radio) without having to re-enter a single detail.